Schluter® TREP-G and TREP-GK stainless steel stair nosing protects interior or exterior tile stair edges while increases safety with its slip-resistant surface. Designed for heavy foot traffic the TREP-G and TREP-GK are great for use in offices and public buildings. Constructed from stainless steel these profiles are both visually appealing and durable. The self-adhesive, replaceable, non-slip tread surface has an embedded mineral grain coating which is available in four colors. 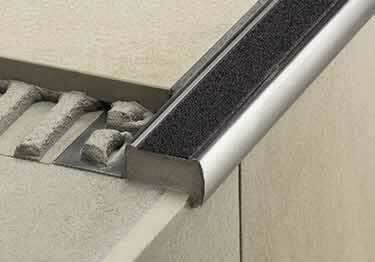 TREP-G features a stainless steel anchoring leg designed to be embedded into the tile bond coat. The TREP-GK is designed to be adhered to existing installations and can be installed as a repair over damaged stair edges. TREP-G Profile Heights: 11/32", 7/16", 33/64", 9/16"
TREP-G Heights: 11/32", 7/16", 33/64", 9/16"